What’s not to love about this simple iron age ceiling hook? It’s robust, beautiful and perfectly industrial. A striking yet minimalist way to hang your carefully created lighting features. Our inherently industrial ceiling hook plate iron age is a minimalist way to create gorgeous drape and drop style lighting. 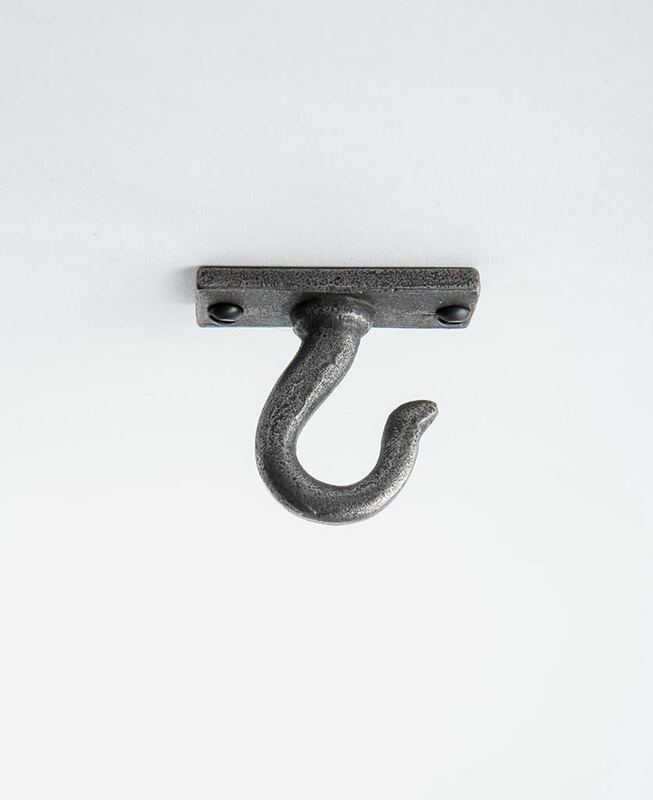 Made from cast iron, this robust pewter toned hook works perfectly in a monochromatic interior. We love this iron age ceiling hook as a rustic accompaniment to a minimalist styled room. Think stormy grey walls, whitewashed flooring and tonal accents of grey in furnishings and accessories. It works wonderfully as part of a ‘drape and drop’ style lighting feature – simply drape a length of sleek fabric cable from your ceiling rose to this hook…then drop it down to cascade beautifully ambient light into less accessible areas of your home. Coordinate with monochromatic tones for maximum impact. We told you it was cool. Use this rugged ceiling hook as part of our create your own lighting range – a collection designed to give you complete freedom in designing your lighting. Choose from ceiling roses, fabric cables, light bulb holders, filament light bulbs and cage style lamp shades, all available in an array of colours and finishes. For a strikingly coordinating aesthetic, we recommend our raw steel accessories – left completely untreated for an authentically weathered vibe. To add lighting to more inaccessible areas of your home, drape a length of fabric cable from your ceiling rose to this iron age hook. Then simply suspend your bulb – So stylish!